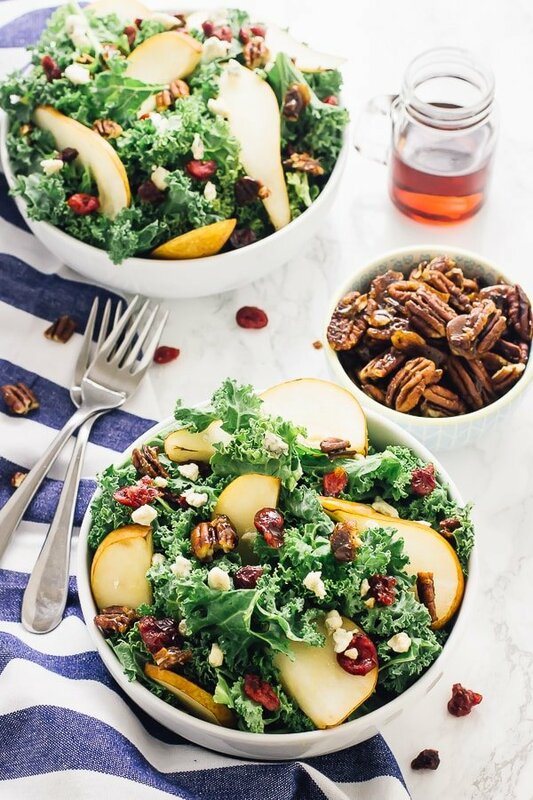 This Pear and Gorgonzola Salad with Caramelised Pecans and Honey Apple Dressing is the perfect fall salad! It comes together in just 15 minutes! 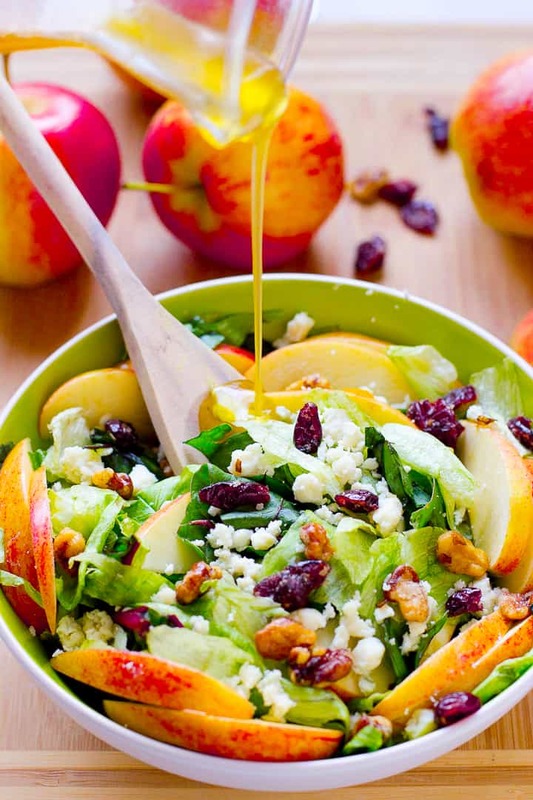 Hooray for fall salads! Spring and salads go great together, but fall salads are probably the best kind. 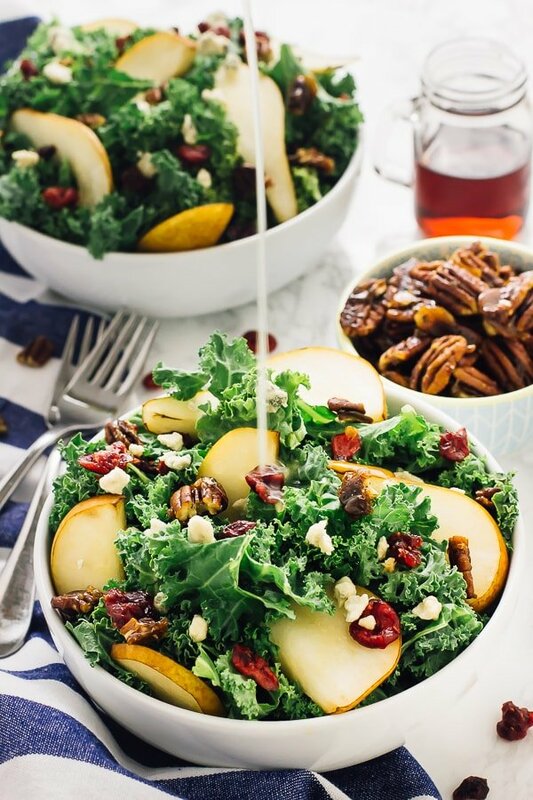 You all seemed to really love my Apple Pecan and Feta Salad so I knew this salad had to be coming up pretty soon. I truly, truly loved this salad – easy, crunchy, sweet, tasty and good for you! Also, caramelised pecans – yes please. 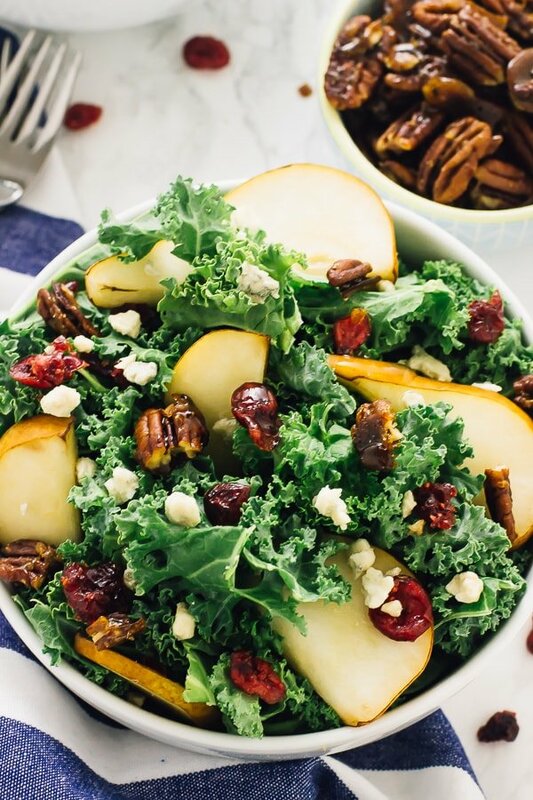 This pecan and gorgonzola salad definitely brings all the flavours of Autumn and Fall. It’s great for lunch or dinner, but most definitely great for Thanksgiving. It’s filled with so many layers of flavours that are pretty much a must in any great salad. Let’s go through the beautiful elements: I love the creaminess and tanginess that the gorgonzola cheese has. Like seriously, who doesn’t love gorgonzola cheese?! You could easy substitute Roquefort cheese or anything packaged “blue cheese” but don’t leave this loveliness out. Next up, the cranberries and pears add a softness, beautiful texture and their own delightful flavours. I really loved the pears in this and they’re so soft and juicy it’s almost like they are caramelised. Speaking of caramelised – those pecans!! I’m sharing the recipe for this soon but these are a dream come true. 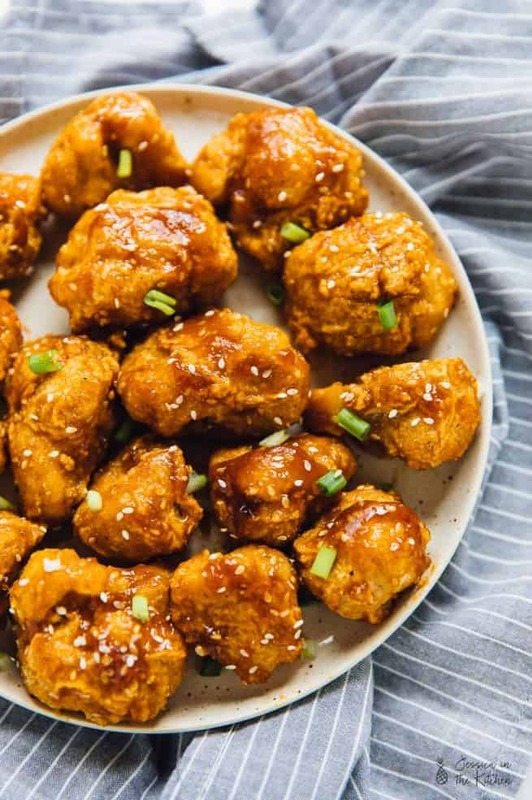 The sweetness and crunchiness balances out everything and they are a must add-in. You can always buy organic natural ones in your local grocery store, or whip them up at home (melt them down in some coconut sugar). The kale adds an unforgettable crunch, but you can blanch it slightly if you want a softer texture. It’s like a big pillowy hug for all the ingredients, a very welcome one indeed. Last but not least, the honey apple dressing. This has been going wild on my blog for the last two years, so I knew I needed to share it in this recipe. Sweet, slightly tangy, and a complete DREAM come true, don’t forget this when making your salad! Have I convinced you yet? I hope so. 🙂 Whip this up, take a bite, and say hello to fall. 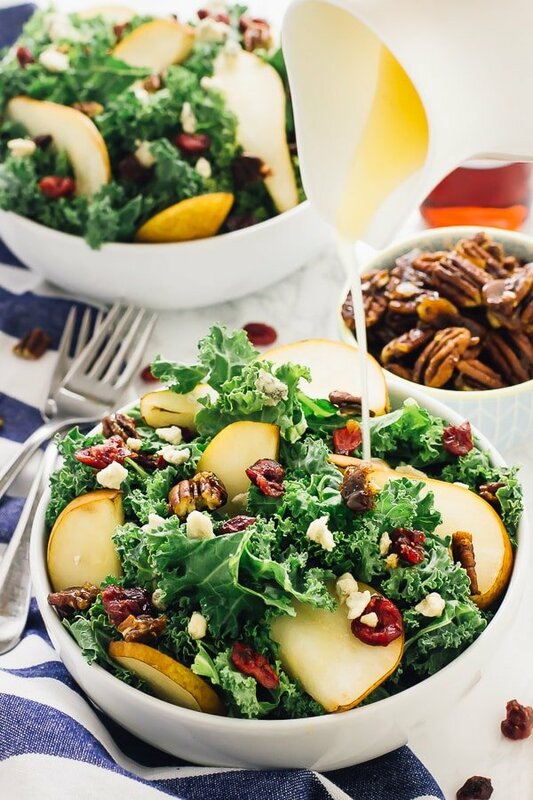 If you try this Pear and Gorgonzola Salad with Honey Apple Dressing please let me know in the comment section below, or tag me on instagram with the hashtag #jessicainthekitchen! For more exclusive recipes follow me on Instagram AND on Snapchat: jessinkitchen. 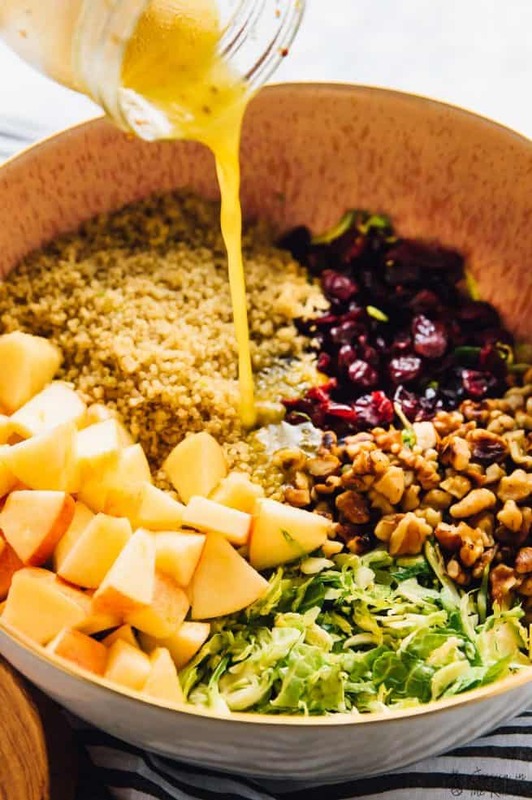 In a bowl, place the salad greens. 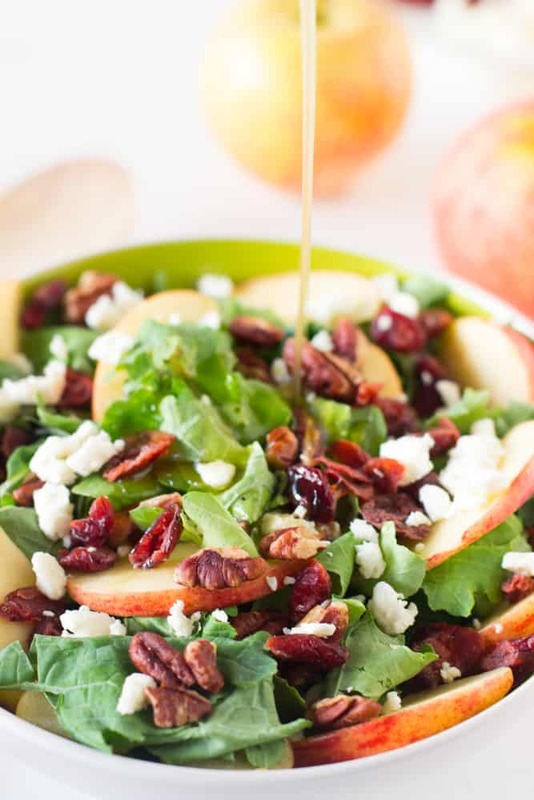 Add the pear slices, cranberries, candied pecans and gorogonzola cheese on top - if you'd like, toss the toppings together in a bowl first then sprinkle on top of greens. So autumnal, tasty and beautiful! Well done, Jessica. You don’t have to twist my arm. You have captured fall in the best way! Hahaha! Thanks so much Tonya!! Hi Nayeli! Baby spinach would definitely be the best substitute!